The figure is a 50 percent increase since the beginning of this year. 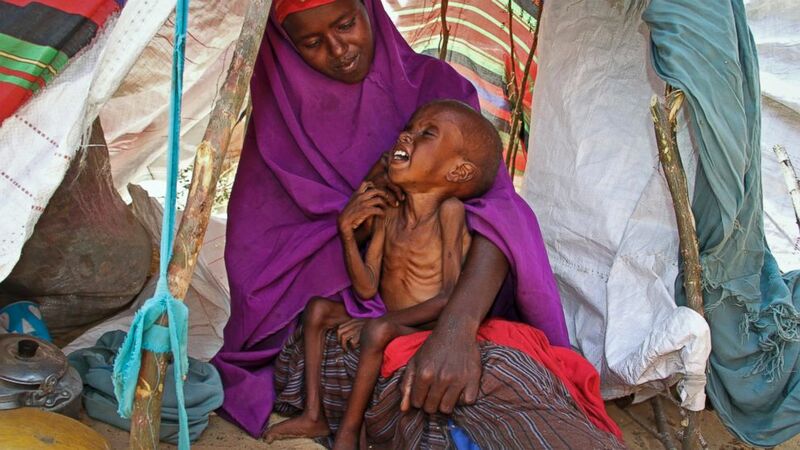 The number of children in drought-stricken Somalia expected to suffer from acute malnutrition has surged by 50 percent since the beginning of this year, according to the United Nations Children’s Fund (UNICEF). Some 1.4 million children -- more than the entire population of San Diego, California -- are expected to be acutely malnourished in 2017, UNICEF said. “The combination of drought, disease, and displacement are deadly for children, and we need to do far more -- and faster -- to save lives,” Steven Lauwerier, UNICEF’s representative in Somalia, said in a statement on Tuesday. (Tony Karumba/AFP/Getty Images) A malnourished child is processed by an aid worker for a UNICEF, funded health program catering to children displaced by drought, at a facility in Baidoa town, the capital of Bay region of south-western Somalia where the spread of cholera has claimed tens of lives of IDP's compounding the impact of drought, on March 15, 2017. 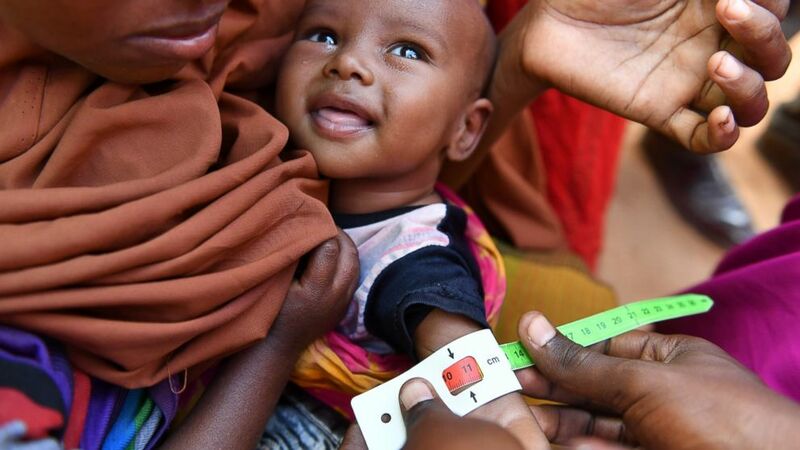 (Xinhua News Agency/Getty Images) An acute malnourished child is measured by the arm perimeter by a UNICEF staff inside the IDP camp in Doolow, in Somalia, on March 20, 2017. 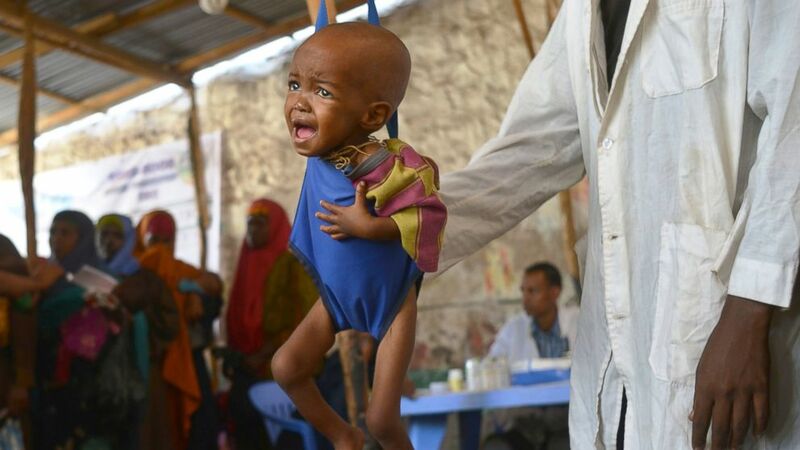 One out of seven Somali children dies before its fifth birthday, and acute malnutrition weakens the immune system, which makes affected children more susceptible to disease such as measles, a UN spokesman told reporters earlier this month. (Farah Abdi Warsameh/AP Photo) A newly displaced Somali mother Sahra Muse, 32, comforts her malnourished child Ibrahim Ali, 7, in their makeshift shelter at a camp in the Garasbaley area on the outskirts of Mogadishu, Somalia, on March 28, 2017. According to Oxfam International, 2.9 million people in Somalia face acute food insecurity at "crisis" and "emergency" levels. The hunger situation could tip into famine if the April to June rains fail or if people's ability to buy food declines. Lack of humanitarian support could also make things even worse. 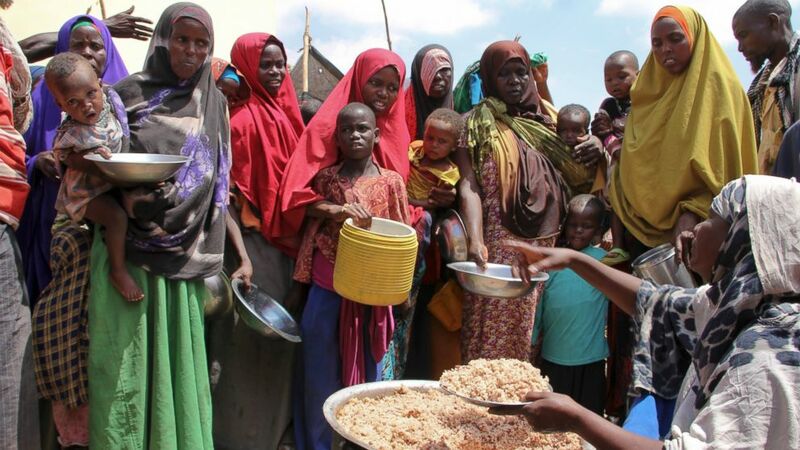 (Farah Abdi Warsameh/AP Photo) Newly arrived Somalis, displaced by the drought, receive food distributions at makeshift camps in the Tabelaha area on the outskirts of Mogadishu, Somalia, on March 30, 2017.